Cucumbers have a refreshing quality, probably in part because of their very high water content. Cucumbers with the peel are an excellent source of Vitamin K. The caffeic acid in cucumbers is said to soothe skin irritations and swelling. 1. Marinate the ground pork with 1 tbsp. Lee Kum Kee Char Siu Sauce,1 tsp. Lee Kum Kee Sesame Oil, 1/2 tsp.brown sugar, a pinch of pepper for 15 minutes. 2. Wash cucumbers thoroughly. Trim cucumbers, cut into 2 inch-thick slices. Use a melon baller to scoop out the centers of slices without cutting though bottoms. Prepare 4 cups. Set aside. 3. In a wok over medium heat, stir-fry the marinated ground pork meat until done. Remove from the wok and transfer to a bowl. Set aside. From the same wok, saute minced garlic, minced onion, diced carrot and diced bell pepper. Return the ground pork to wok, mix well and keep stir-frying while adding a pinch of salt and pepper to taste. 4. 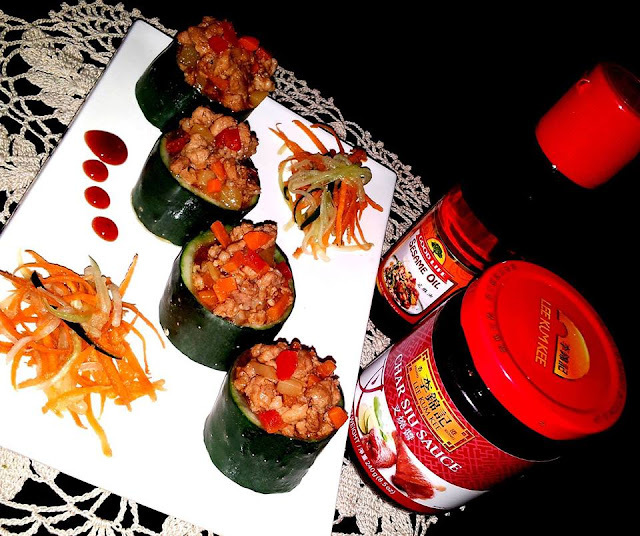 To serve, fill each cucumber cup with the ground pork mixture. Put it in a serving plate. Garnish with shredded carrots and cucumber. Add drops of Lee Kum Kee Char Siu Sauce on the side of the plate.